I’ve written for years here about the National Road, which was the nation’s first federally funded highway. (See everything I’ve written here). It was authorized by Thomas Jefferson in 1806 and built from Cumberland, Maryland to Vandalia, Illinois between 1811 and 1837. Today, if you’re on US 40 between those two cities, you are on or near the old National Road. And so the old road lives on. 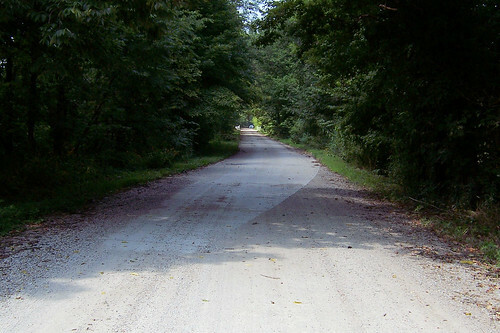 In Indiana, the National Road was originally little more than a path through the woods. After the state formed its fledgling highway network in 1917, the road was surfaced in gravel and, sometimes, brick or concrete. But starting in the 1930s the state undertook a very ambitious project to make our section of US 40 one of the finest highways in the nation – four divided lanes in the country, three or four lanes through towns and cities, and paved in concrete all the way. We take such roads for granted today, but in those days highways were narrow, winding, and sometimes even unpaved. 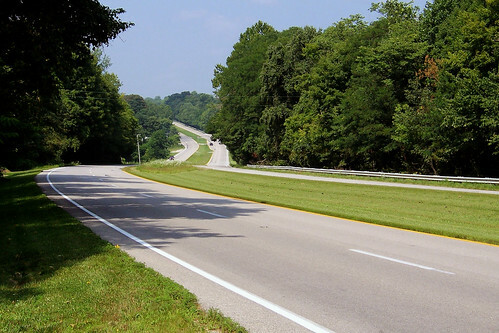 The new US 40 leveled the terrain, straightened the most wicked curves, and provided a wide and smooth surface, allowing for high-speed travel. It was a marvel! Except for having been resurfaced in asphalt, it remains today just as it was. Here’s an especially beautiful section of it in Putnam County near Manhattan. I’ve been trying to piece together a timeline of this improvement project for years. Recently I read the book US 40: A Roadscape of the American Experience by Thomas Schlereth, which the Indiana Historical Society published in 1985. Glory be, there it was on page 94: a diagram showing when each section of the road was upgraded. Click it to see it larger. This project left behind several older sections of the road. They give a sense of what an American highway was like in the 1920s. 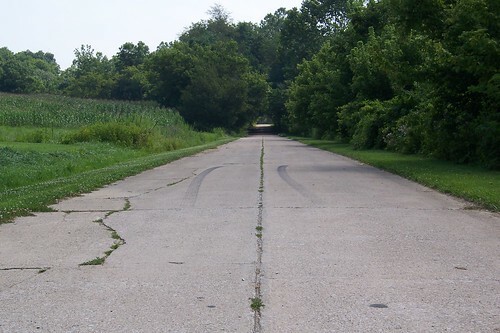 The only old alignment east of Indianapolis is a four-mile stretch between Dunreith and Knightstown. A whole bunch of old road remnants lurk west of Indianapolis. This one is actually in Indianapolis and ends at the western city limits, which is where I stood to get this photo. A stripe of asphalt covers concrete laid in the 1920s. Modern US 40 is just outside the photo on the right. Just west of there is an alignment bypassed because of an odd-angle intersection with a railroad track. I’ve seen historic aerial photography of this area that shows that this segment was bypassed by 1937, which is before the widening project came to this part of the state. Unfortunately, this alignment was bisected in 2006 by the new Ronald Reagan Parkway. 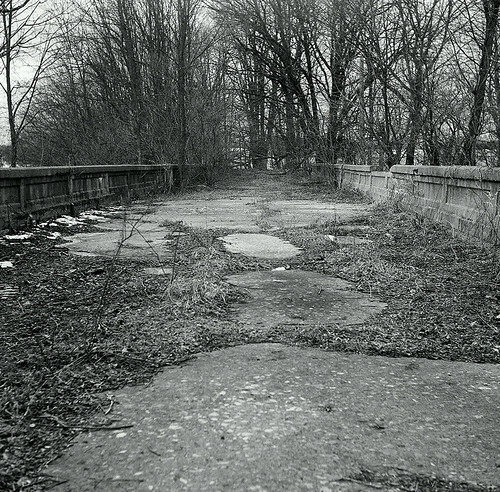 Just west of Plainfield, a bridge stands abandoned after two new ones were built on the new alignment in about 1940. Trees are growing in the bridge’s deck. 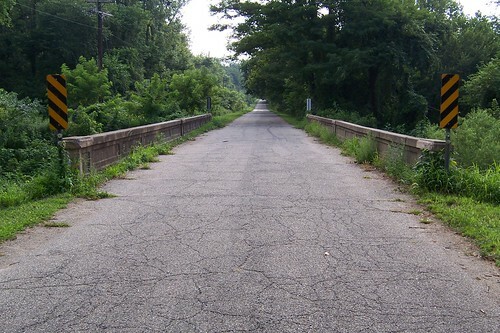 Just beyond this abandoned bridge, a remnant of 1920s concrete lines up perfectly with the current road’s westbound lanes. 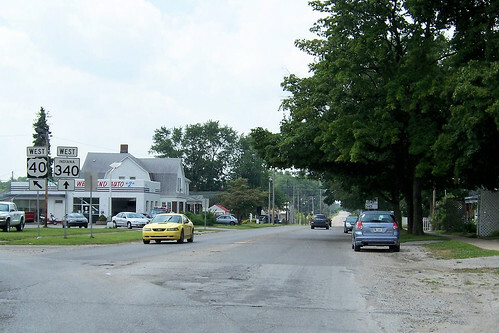 Putnam County boasts the most bypassed segments of Indiana’s National Road. This brick segment is on private property just west of Mt. Meridian. I estimate that these bricks were laid between 1922 and 1925. A realignment near Putnamville left this stretch of concrete behind. It dates to probably the late 1920s. Notice the seam down the center and the occasional lateral seams. 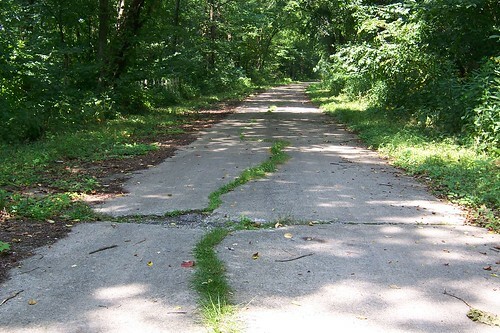 My experience has been that if a concrete road has seams, it is from no earlier than 1925. Earlier concrete roads typically contain no seams. 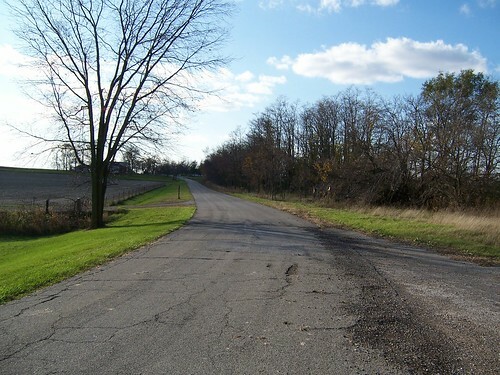 The Putnamville Correctional Facility still uses a section of the old road. Notice how it undulates with the terrain. Modern US 40 is flat. This short, narrow old alignment is near Manhattan. Notice the lack of seams in the concrete. My experience has been that seamless concrete roads are generally from the late 1910s to about 1925. 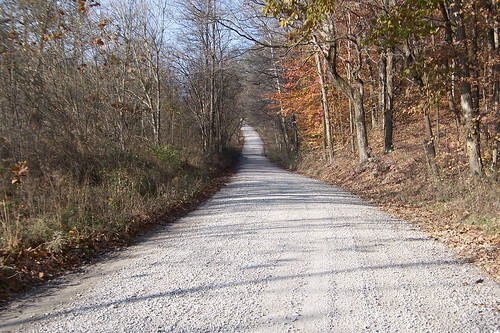 Before then, concrete was considered an experimental road surface, and was seldom used. The road was realigned twice near Reelsville. The oldest alignment was never paved. This is as close as it gets to the original National Road experience anywhere in Indiana, and perhaps anywhere along the entire National Road. Here’s another shot of this alignment, taken in summertime. This old alignment eventually merges with another old alignment of 1920s concrete. 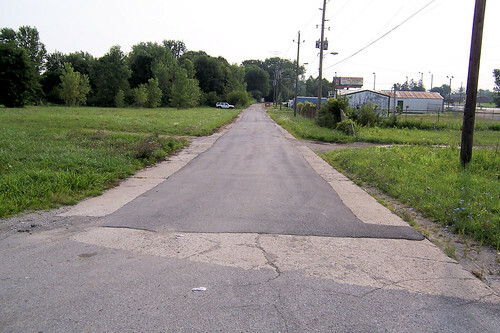 The concrete road was torn out for several hundred yards from this point east, or left in the photo. 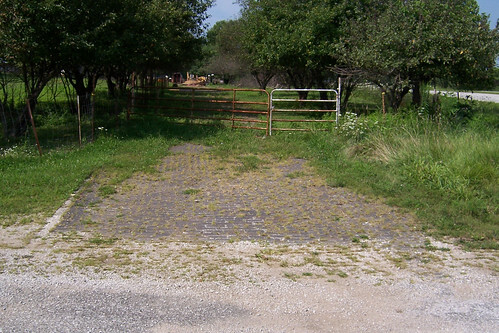 This concrete road soon becomes somebody’s driveway. We’ve been heading steadily westbound so far, but this concrete alignment has another segment to the east and south, so I’m going to back up a little to show it. 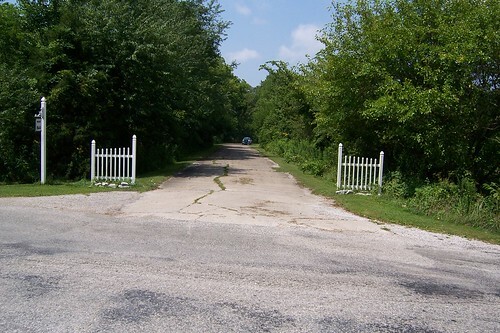 It is just an access road to a couple of homes, and so it gets little maintenance. Encroaching nature has effectively narrowed it to one lane. The next old alignment of US 40 is still a highway. State Road 340 stretches from the western edge of Brazil in Clay County to the Vigo County line. Here’s where it begins in Brazil. 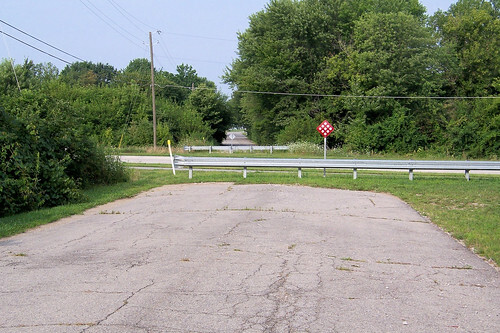 The last old US 40 alignment begins in Toad Hop, a small community just west of West Terre Haute. It disappears about three miles later into the fill where modern US 40 and I-70 merge. 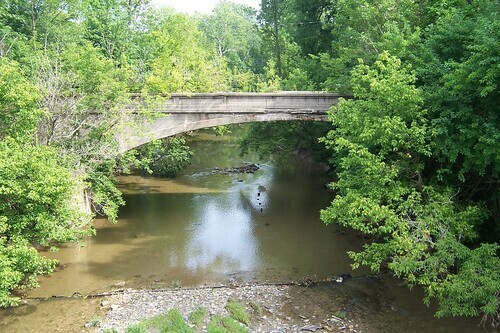 This 1919 bridge is is near the end of this alignment. With the exception of SR 340, these old alignments don’t get much use. But US 40 itself isn’t very busy either anymore. I-70 parallels it across the state, and with limited access and a 70 MPH speed limit, that’s where all the traffic is. US 40 was rerouted along I-465 in Indianapolis about 20 years ago, and along I-70 in Terre Haute a few years ago. It is probably only strong opposition from county officials who don’t want the burden of maintaining the road that keeps US 40 as it is everywhere else in Indiana. How do I find all these old alignments? My secrets are revealed here. Fascinating. Beautiful shots…and sad but time and progress ( ? ) march on. Thanks! I’ll bet you’d enjoy a drive along some of these old alignments. I’m not sure I’m sad, however, that these old roads have been bypassed. They were narrow, and because they followed the terrain they were hilly and curvy. That made for a certain charm, to be sure, but the modern roads allow for swifter and safer travel. Excellent summary. Well written and nicely illustrated. Thanks Denny! And if you click each photo, it takes you to Flickr. I’ve geotagged each photo, so if you click the location link on the photo, you can see a map of where it is. Wonderful read and pics Jim, and now you have shared my new all time favorite small community name Toad Hop LOL !! It’s almost as good as Lick Skillet, the former name of a crossroads near here! You have so much ‘space’ in Indy. Love your road pictures, maybe you could use a tripod and jump in one sometime? I aim to please. 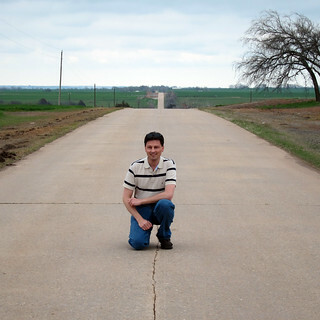 Me on old Route 66 somewhere in Oklahoma. Very much enjoy these various comments. 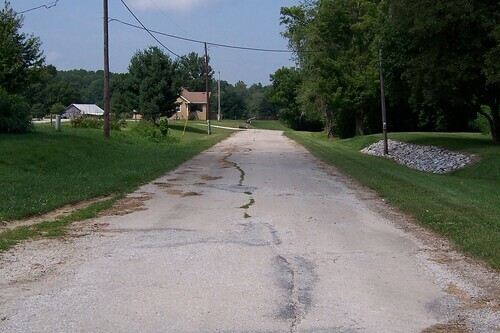 We travel the US 50 area between Lawrenceburg, Indiana, Versailles and the areas on each side and see evidence of the “old roads” but knew very little of them. These discussions have prompted me to look more closely and I will “report” anything I find interesting. A note on nostalgia: the “good” in the “good old days being gone” is true. We have Amish in our area and their vehicular “pollution” is no more desirable than ours. You just get to select nuisances not eliminate them! I often wondered how paving methods reported the age of the construction and these blogs have been helpful. I watched some recent highway construction and wondered what folks 4o years from now will be thinking as they look at a section of road being torn up and rerouted. 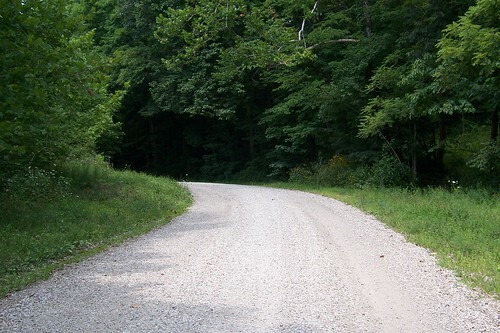 We know of a back road near us of which one section is exactly as it was in the early 1800’s; another section as gravel only Another section as it was first paved, though probably dating in the 1960’s. Gives a physical history book that can be “read” now. 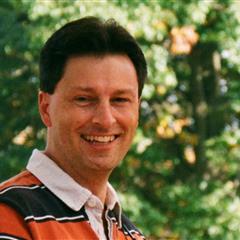 Thanks, Jim and all who contribute. Dave, once you start seeing the old road remnants, they start jumping out at you. A buddy of mine who lives in Terre Haute contacted me a couple years ago to say that roadwork on Wabash Ave., the main drag, which used to be US 40, revealed brick pavement underneath several layers of asphalt. A lot of old roads lurk beneath our modern ones. Imagine reading that history book. 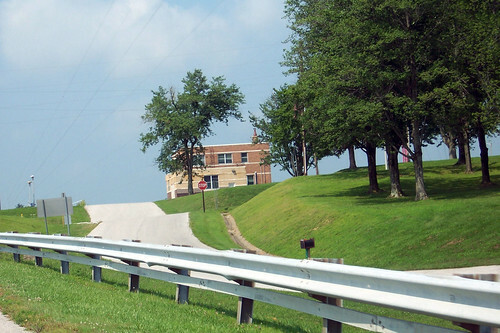 Pingback: Frankfort Writers Center » Did You Know that Clinton County Was Part of Indiana’s First Super Highway?